Remarkable Property - 10 Acres With Pond, Stream And Forest. Spacious 4 Level Sidesplit Completely Renovated. Long Driveway With Fenced In Cleared Table Land And Gated Entrance. 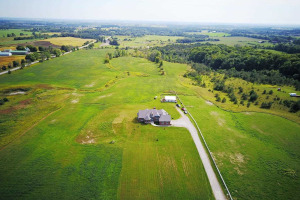 Minutes To New 407 Highway Extension, Hiking Trails, Forested, Large Pond And Stream. Close To Taunton Rd With Big Box Malls, Movie Theaters, Recreation Centre And Restaurants. New Renovation Inside: New Kitchen, New Washrooms(All), New Laminate Floor,...Etc. Appliances Neg., Propane Tanks Rental, Hw Tank Electric, B/I Dishwasher, Fridge, Microwave, Dish Washer, Approx 4 Acres Cleared & Fenced. Approx 6 Acres Wooded. Paved Driveway, Gated Entrance, Close To Expanding Development.